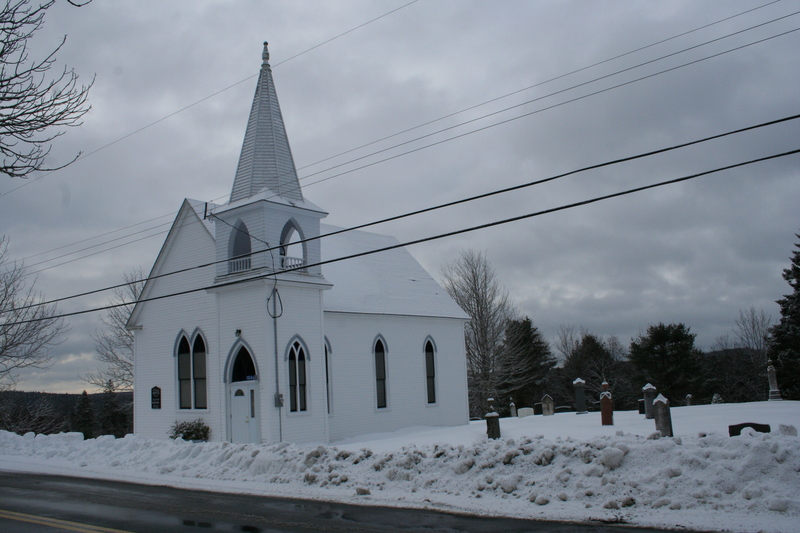 I have mentioned St John’s Anglican Church several times in my Blog, mainly because we love to visit this Church when concerts are held there. 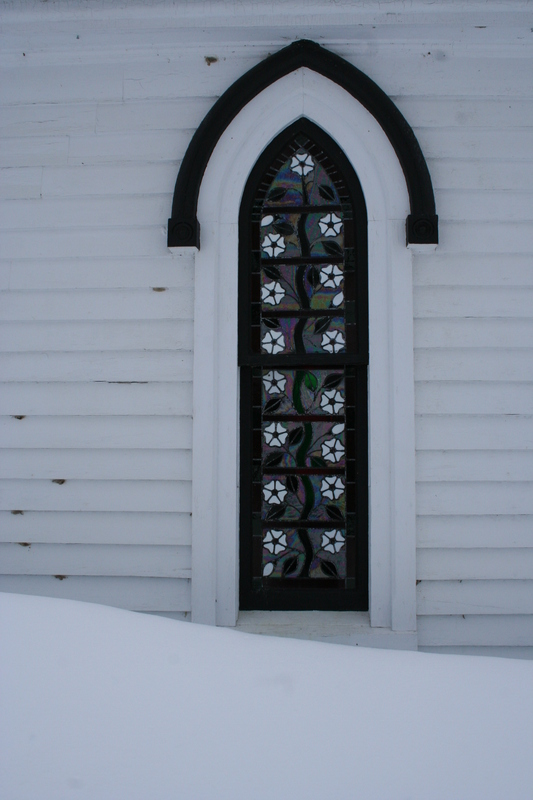 I also gave some links to it and the history of its rebuilding after the fire in 2001, in my December 2008 Blog. 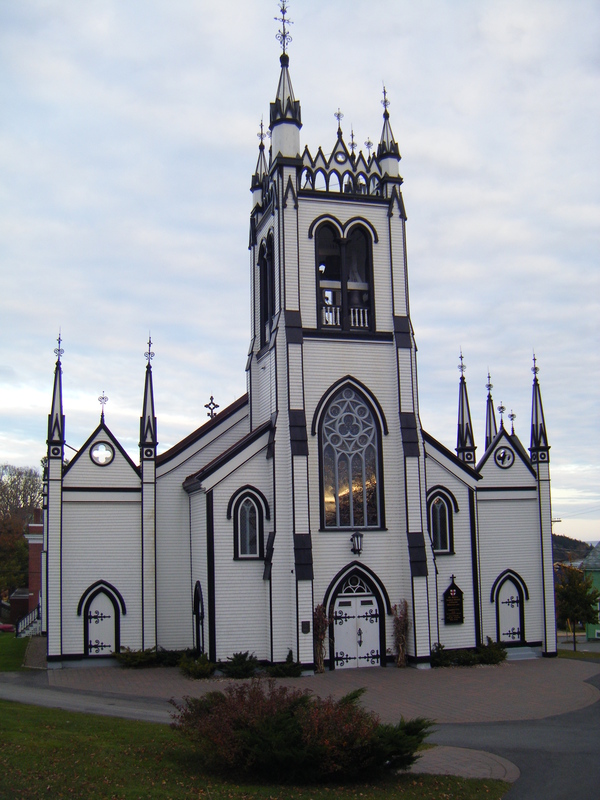 This Church is in the centre of Lunenburg and we walk past it most days. It is a great landmark and I can’t imagine how the locals felt when it was destroyed. 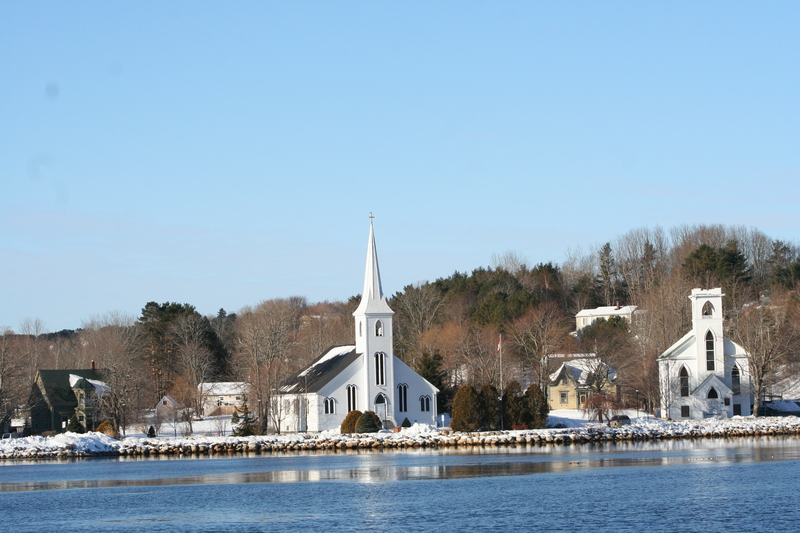 Other local landmarks are the three Churches at Mahone Bay. 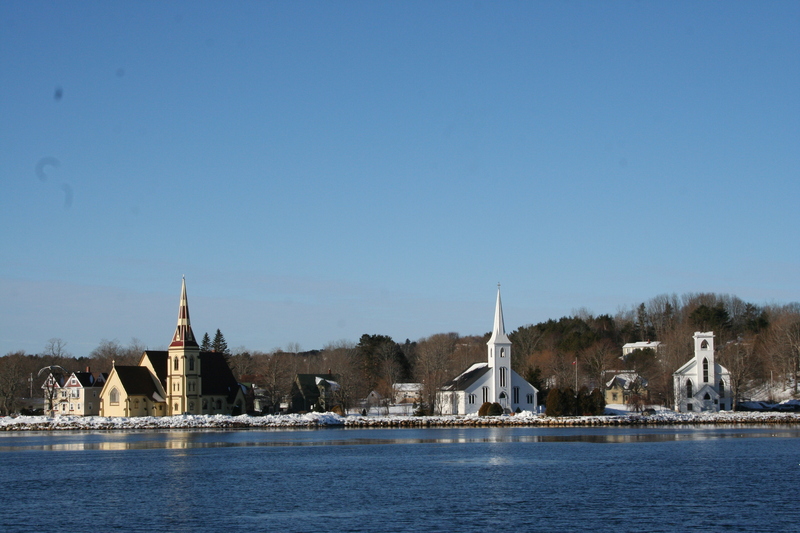 Photos of these three churches, that stand at the edge of the water are common on postcards and posters of the town. Two of these churches are painted white, whilst the third is a sort of mustard yellow. 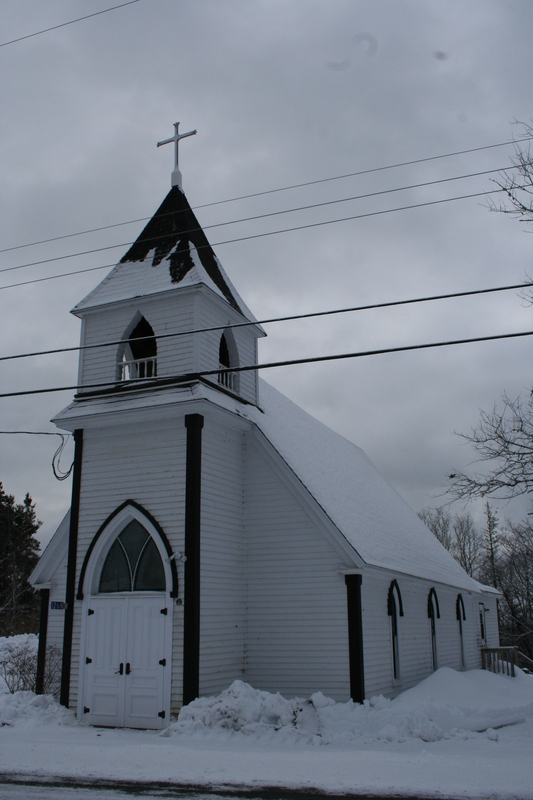 White painted wood, with black roofs is pretty much the norm for churches here in Nova Scotia. But bell towers and spires vary and would depend on which part of Europe the immigrants came from. It is difficult to photograph these churches without these blasted wired getting in the way! 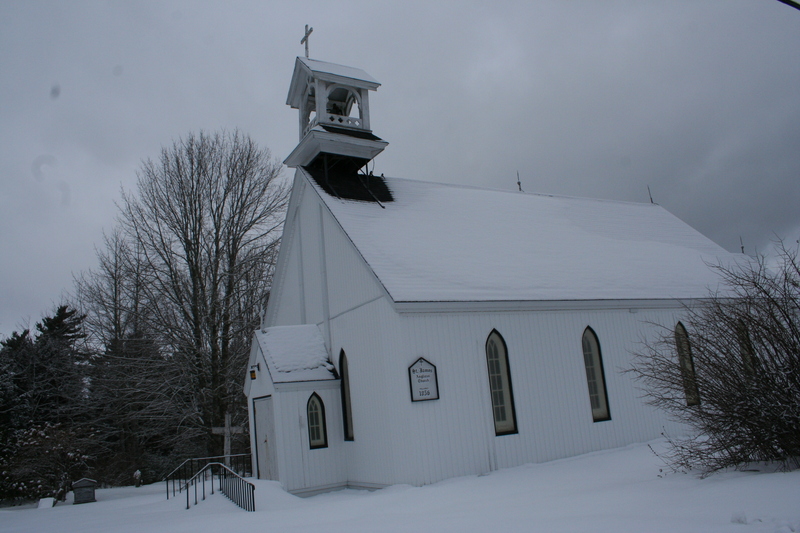 As people settled in Nova Scotia, they built their church, as it had been in their homeland. So, there are Roman Catholic, Presbyterian, Anglican, Baptist, Evangelical, Methodist,and Lutheran churches. 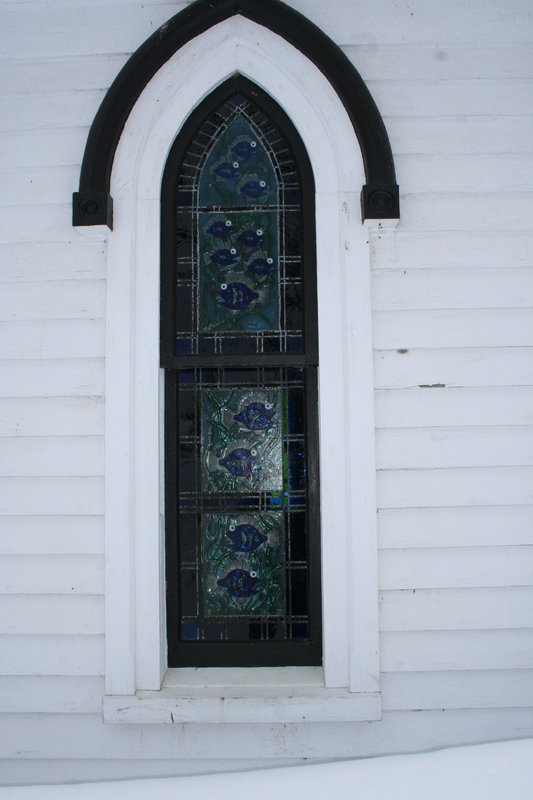 There is even a Zion Evangelical Lutheran Church in Lunenburg! 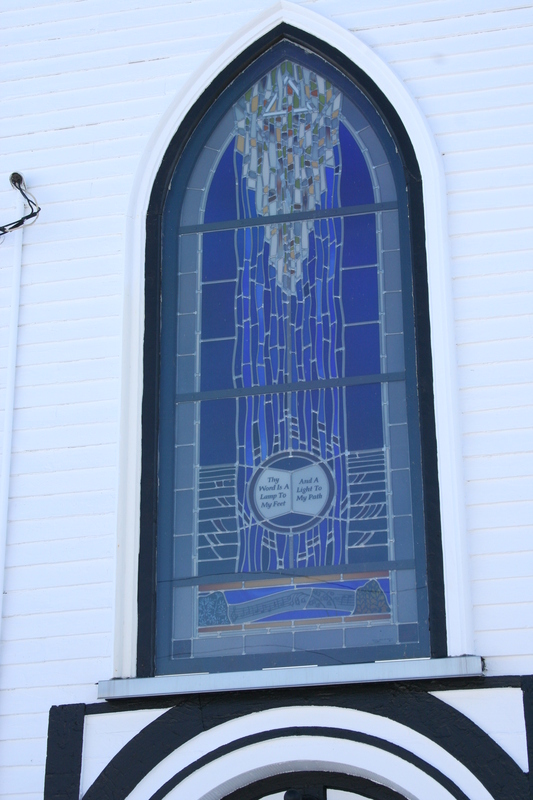 In many places there is a United Church, but often there are different services – Baptist at one service, then Anglican later. 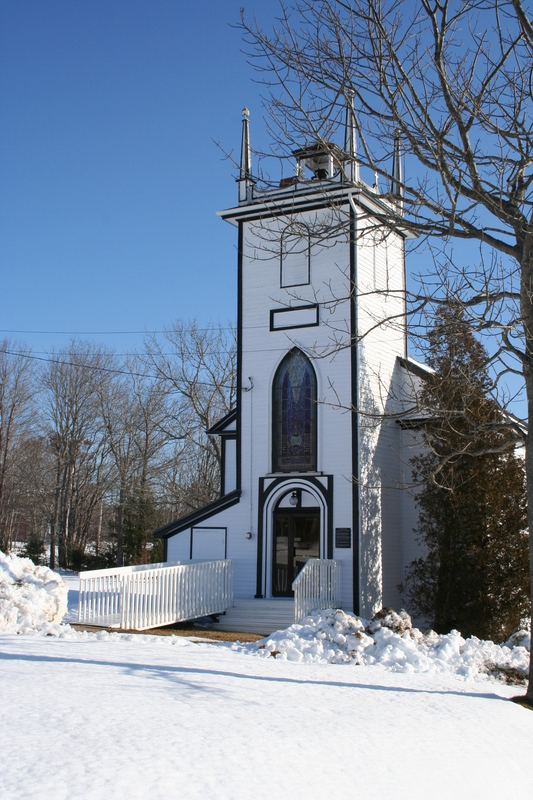 This church has an unusual bell tower on the top. And I thought this was a waterfall in the window, but perhaps it has meant to be a light? Here is another little bell tower. I enjoy following the Blog of a great photographer from Finland. He has photographed many old churches, but I particularly enjoyed the one of a very old Church in Petajavesi, in Finland. I love the very rustic interior. Take a look. His photographs are in a different class from mine. 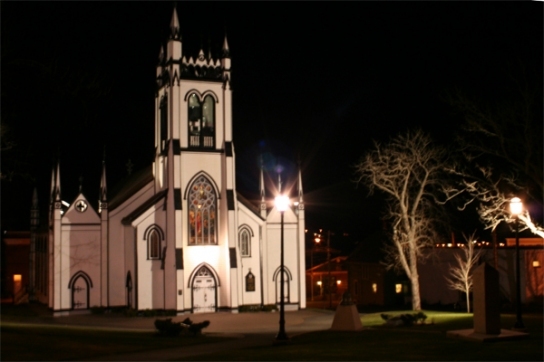 On Friday night Jeff and I attended the King’s Christmas concert at St John’s Church in Lunenburg. Last year we were at the Concert of 100 Candles. The setting of St John’s Anglican Church is just magnificent and makes any concert a delight. 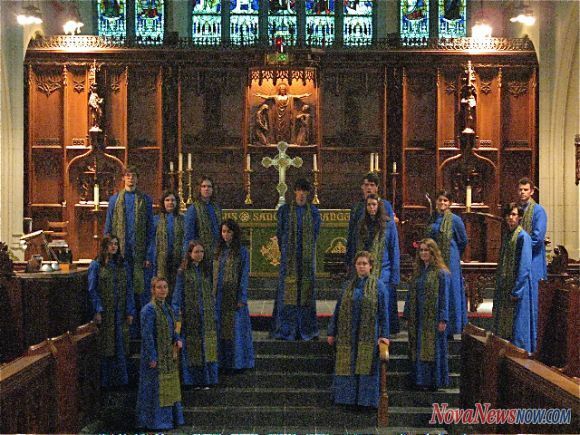 The Chapel Choir of the University of King’s College in Halifax comprises of 20 choristers selected through annual auditions. They entered the concert from behind us and sang Angelus Ad Virginem as they walked down the aisle. This picture below is a library picture and does not show the inside of St John’s. The carols were interspersed with readings and poems. 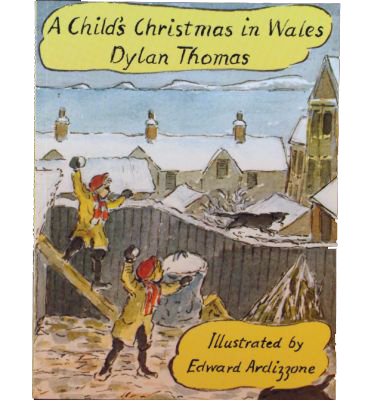 A Child’s Christmas in Wales by Dylan Thomas is one of my favourites and Christmas is never Christmas without listening to it. Here is a link to it on someone else’s Blog for those of you who want to enjoy it. Suzie LeBlanc, the renowned Canadian soprano, entertained us with a couple of solos. Here is a taste of her wonderful voice. Another good reading was The Twelve Days of Christmas, A Correspondence, by John Julius Norwich. A different slant on the old Twelve Days of Christmas we all know. 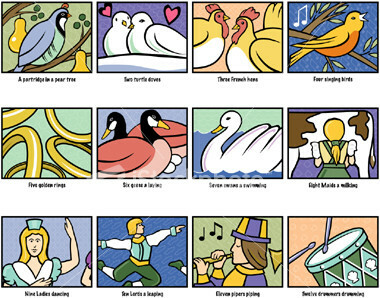 enchanting, romantic,poetic present! Bless you and thank you. What a surprise – four calling birds arrived this morning. grateful – of course I am. meant well, but – let’s call a halt, shall we? joke? If so, I’m afraid I don’t find it very amusing. less – kindly stop this ridiculous behaviour at once. ambulance. I hope you’re satisfied. This was another top class concert held in our little town of Lunenburg. We are so lucky to have such wonderful facilities and entertainment. We look forward to the next concert at St John’s. Yesterday Louise and I attended a lunchtime concert at St John’s Anglican Church. This was the venue for the ‘Concert of 100 Candles’, I wrote about on 7th December. It is a beautiful setting for any concert. It was snowing heavily but we decided to brave the storm and enjoy the music. Pamela Rogers, soprano, sang a selection of Christmas favourites whilst her father, Wayne, accompanied her on the piano. I thoroughly enjoyed the variations to some well know pieces. At the end of each song, I felt that we should show our appreciation, by applauding, but being a reticent Scot, I thought I’d wait for the others to lead – which they didn’t. Wha asked me the road and the miles to Dundee. — -Now try and sing the words of ‘Away in a Manger ‘to the tune of this. For those who don’t know the tune then’ The Corries’ will help you. There’s no shortage of online concerts with this Christmas favourite. This was a most enjoyable concert and I hope to have the pleasure of hearing Pamela Rogers in the future.